Cut the time you spend writing your hashtags and captions with Saved Captions. With this feature, you can now create templates to save your most commonly used hashtags. When it’s time to schedule, simply select one of your Saved Captions to add it to your post. Having trouble deciding on which hashtags to use? With Hashtag Suggestions, you can see which hashtags people are using together, and discover new relevant hashtags so that new followers can discover your posts. Saved Captions are bits of text that you use over and over again -- for example, groups of hashtags. Saved Captions are designated within a group. Only the team members & social profiles that are part of that group can access the Saved Captions. Use Saved Captions for any text you wish to re-use to quickly add to your posts, such as captions, mentions, or separation breaks (periods) - for styling, campaigns, and more. To save time, open an existing post that contains your most frequently used hashtags. Next, name your Saved Caption, make any last edits, and click Save Caption. Saved Captions are great for saving time when scheduling the same content for Instagram, Twitter, Facebook, and Pinterest. 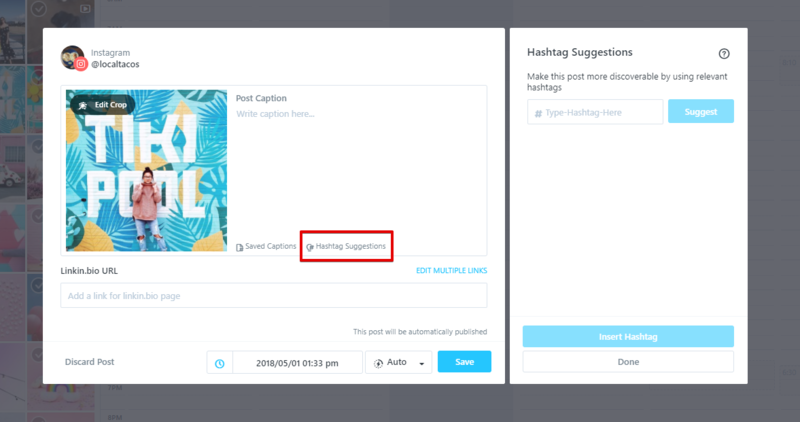 Now you can create a Saved Caption of generic hashtags and use them across the board when scheduling your posts. So now that you’ve created your Saved Captions, let’s take advantage of them! Drag a photo into the Content Calendar to schedule a post. Next, click Saved Captions and either use the search bar to browse by title or scroll to find the right template. Select one or multiple Saved Captions to add to the post. Finally, click Done and then Save to finish scheduling your post. To delete or edit a Saved Caption, open the Saved Caption window, then click "EDIT" next to the caption you'd like to delete or edit. Don't forget to hit Save Caption when you're done editing! Important: Only available on Later's business plans - starting at Premium. While you're working out your hashtags, use Hashtag Suggestions to find some suggestions that you may not have considered! Type in a hashtag you want to use in the text box at the top, hit "Suggest", and up to 30 relevant hashtags will generate, sorted by relevance! From here, you can choose which hashtags to use (or select them all), see how many public posts have used it, and how relevant it is to your chosen hashtag. Relevance is an algorithm based on how often those hashtags are used together - the higher the relevance, the more likely someone searching those hashtags are to be looking for something that covers them both! 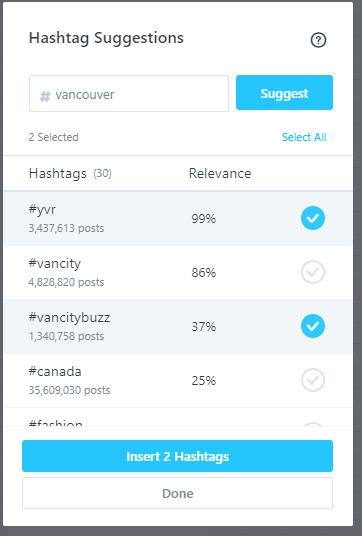 For example, as you can see above, #vancouver and #yvr (Vancouver's airport code) are highly relevant hashtags for each other -- meaning that searches for #yvr and #vancouver are going to generate a lot of the same posts, and it may be worthwhile to use both so that you're seen in both searches! Simply hit 'Insert Hashtags', and you'll see them at the end of the caption you've written! With these two tools, you're ready to hashtag with the best of them, and keep your lists handy for future posts.